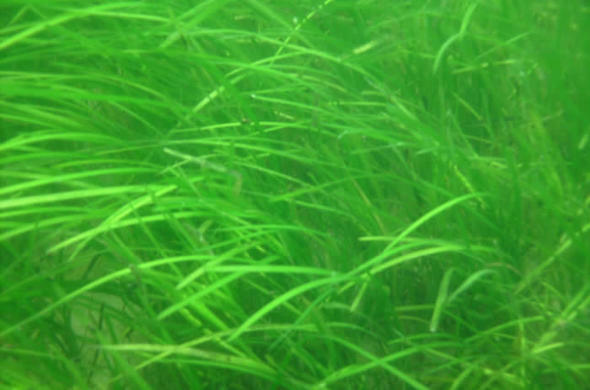 Eelgrass is an estuarine species that binds the sediment, shelters small fish, and yields detrital food. Eel Grass has creeping roots and narrow flat leaves with rounded tips. The blades are 10 - 30 cm long and 1 mm wide. Halodule uninervis (estuarine, St Lucia northwards) is similar, but its leaves have three-pointed tips. Three Cymodocea species (common in calm tropical waters), have strap-like leaves 10 - 15 mm wide. Eelgrass is an important species in tidal estuaries where it provides food and shelter for a number of species of fish and invertebrates.